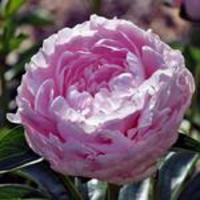 General - We like to send out generous-sized peony divisions, produced from plants which would have flowered in the upcoming year. The divisions have 3-5 eyes and often more. These divisions frequently flower the first year (although of reduced size) and continue to do so annually as the plant develops to mature size over the next several years. However, if subjected to first season adversity or placed in chronically unfavorable growing conditions, it may take several years to see a flower, or the plant may die. For helpful references, see "Additional Information", below. Planting - Any time before the ground freezes is alright. Autumn is the best time. The divisions are sent to you ready to plant. The buds from which next year's shoots will grow are already evident. See the diagram below. Upon receipt of your plants, check them. They are packed in breathable plastic with a small quantity of damp peat. We send dormant plants and, if necessary, you may hold them in the packing for a time before planting out, just keep the packing slightly damp - NOT WET! Dig a hole in previously prepared, moist soil that is deep enough and wide enough to receive the plant so that the bottom of the shoot buds (also called "eyes") can be placed two (2) inches under the surface and roots pointed outward/downward. (In the South, eyes just one inch under, for maximum winter chilling.) Pack the dirt around each root so the division will not settle too deep when watered. Hill up or mulch over the plant for the first winter to reduce frost heaving and prevent standing water. Mark each plant with variety name on a stake and make a planting chart for future reference. 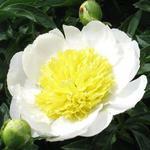 Site and Care - Peonies must make good growth and large storage roots in order to perform well. They do best in the same situation where you can grow an excellent vegetable garden. Full sun supports best growth, but flower durability may be prolonged by light shade and by shelter from strong winds. Do not allow lawn grass to grow over the root zone of your new peonies, at least not until after the bush becomes large enough to shade out the grass. Cultivation is better. Special Instructions for the South (South of I20) - Peonies may be marginally successful and should be tried experimentally, failures typically resulting from shortfall of chilling hours for the reduction of winter dormancy. Individual varieties are variable in this respect so that it should be possible to identify favorably constituted kinds. Ask locally. In absence of more specific information, it is recommended that the best prospects for testing are among the earlier flowering hybrid herbaceous and tree (shrub) peonies. Also, irrespective of dormancy considerations, late opening, full petalled peony varieties (as of those which open their flowers only on the plant) often spoil in bud in high temperatures, a circumstance which is more likely to be experienced southward. 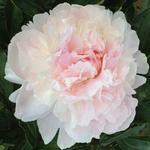 Please find a more detailed discussion on how to succeed with peonies in the south at: Growing Peonies in the Deep South Revisited. 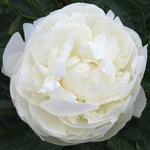 Additional Information - How to Grow Fine Peonies Almost Anywhere provides additional information on how to grow peonies.